PTC (potential tropical cyclone) 18 is in the northwestern Caribbean. 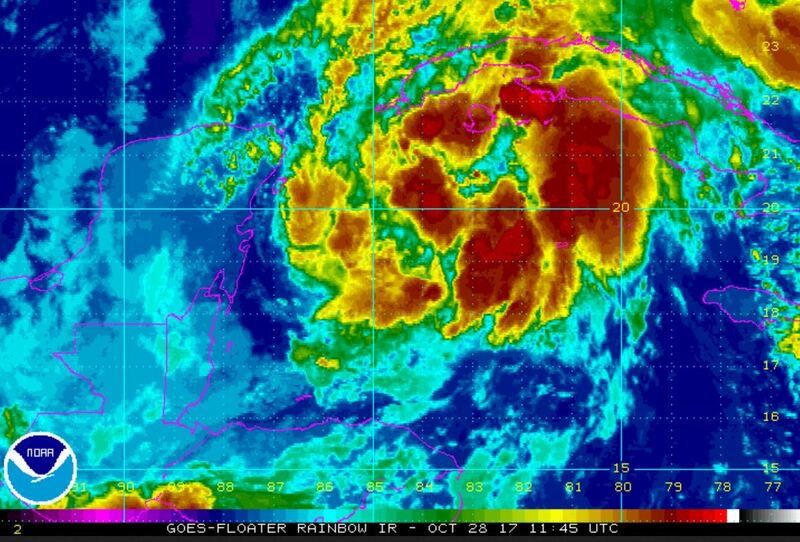 Deep convection has finally started to build around the broad center of circulation. 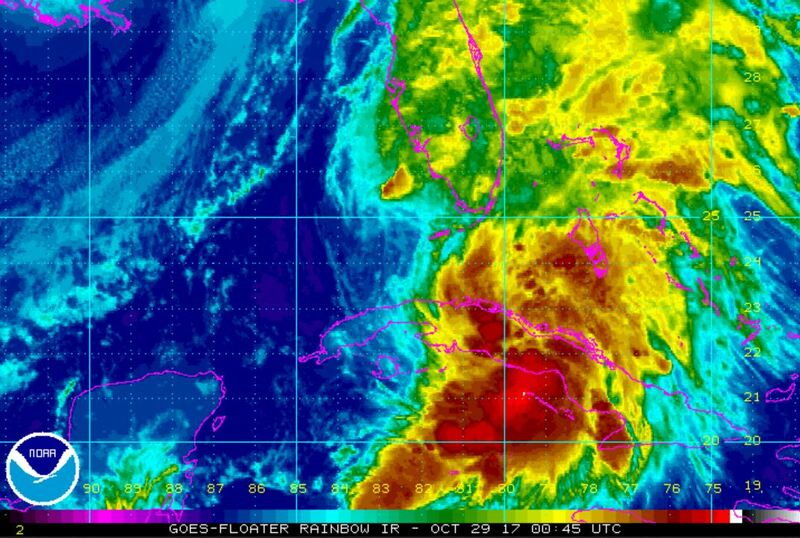 Heavy rainfall will move over western Cuba into south Florida today and tonight. The main concern will be heavy rainfall. As of 8:00 AM EDT PTC 18 was centered at 19.7 N / 84.0 W or 250 miles SSW of Havana, Cuba. It was moving NNE at 10 mph. Top sustained winds are estimated at 35 mph. Pressure was estimated at 1005 MB. Philippe will move over western Cuba then into the Florida straits SE of Miami by tonight. It will move through the NW Bahamas on Sunday morning then move rapidly NE gradually losing tropical characteristics as it merges with a front over the Atlantic. Philippe was classified as a tropical storm at 5 pm today. It is rapidly moving north. 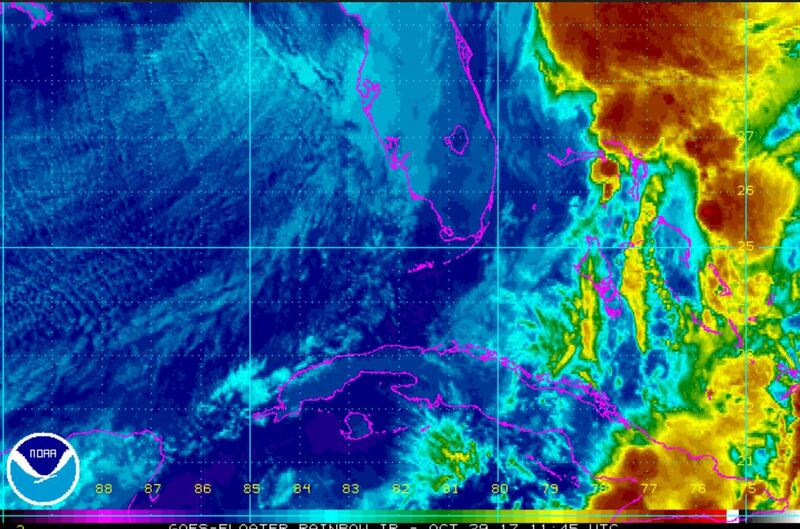 This will limit rainfall over south Florida. IMO Philippe is really not a storm. It may have winds to 40 mph, but the surface center is hard to discern. Either way, there will be some locally heavy showers in south Florida into Sunday. As of 8:00 PM EDT Philippe was centered at 23.7 N / 82.7 W or 75 miles SW of Key West, FL. It was moving north at 28 mph. Top sustained winds are estimated at 40 mph. Pressure was estimated at 1002 MB. Philippe will move through the NW Bahamas on Sunday morning then move rapidly NE gradually losing tropical characteristics as it merges with a front over the Atlantic Monday. Philippe is really not a tropical system and possibly not a subtropical system either. A few heavy showers are still in the northern Bahamas and eastern Cuba with this system associated with a strong cold front. As of 8:00 AM EDT Philippe was centered at 27.6 N / 79.0 W or 100 miles east of Vero Beach, FL. It was moving NE at 32 mph. Top sustained winds are estimated at 50 mph. Pressure was estimated at 997 MB. Philippe will merge with a Nor'easter today and tonight. It will interject energy into that system which will bring heavy rain and strong winds to the northeast. This is a similar situation that occurred at this time of year in 1991 which was called "the prefect storm". SE Florida coast in Broward county report 5-6" rain totals.